New York Times bestselling author Adriana Trigiani takes us from the cobblestone streets of Greenwich Village to lush New Orleans to Italy and back again, from the tricky dynamics between Old World craftsmanship and New World ambition, all amid a passionate love affair that fuels one woman’s determination to have it all. For more than one hundred years, the Angelini Shoe Company in Greenwich Village has relied on the leather produced by Vechiarelli & Son in Tuscany. This ancient business partnership provides a twist of fate for Valentine Roncalli, the schoolteacher-turned-shoemaker, to fall in love with Gianluca Vechiarelli, a tanner with a complex past . . . and a secret. But after the wedding celebrations are over, Valentine wakes up to the reality of juggling the demands of a new business and the needs of her new family. Confronted with painful choices, Valentine remembers the wise words that inspired her in the early days of her beloved Angelini Shoe Company: “A person who can build a pair of shoes can do just about anything.” Now the proud, passionate Valentine is going to fight for everything she wants and savor all she deserves—the bitter and the sweet of life itself. 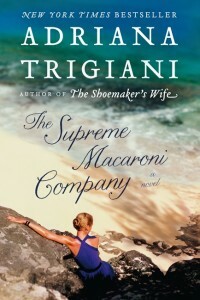 In The Supreme Macaroni Company, Adriana Trigiani combines three of my favorite things: realistic romance, shoes, and Italian-American culture. Having grown up in a New Jersey Neapolitan family, it is the latter, especially, that really resonated with me. In the voices of Valentine, her lover Gianluca, and the rest of her family, I heard echoes of my own wild, crazy, broadly gesticulating, incredibly LOUD grandmother, aunts, uncles and cousins. Not having read the previous novel in this series, I did feel a bit as if I had been thrown into the deep end of a pool, with leaky water-wings, but soon enough I had figured out all the relationships, and the experience ultimately enhanced my enjoyment of the story, because I imagine Gianluca felt the same way. Trigiani’s characters all have delightful eccentricities, some of which are more subtle than others, but they all seemed like people I might know (or be related to). Having also grown up in a couple of family businesses, I could really identify with Valentine’s journey toward business success, a journey that was both aided and overshadowed by her family. I thought the romance between Valentine and Gianluca was well-written, reminding me a little of my own parents’ relationship, though my stepfather is only 15 years older than my mother. On the whole, this was a gripping family drama with enough romance to keep things tingly, despite a poignant ending, and enough talk of food to make even a gluten-free vegan crave a plate of lasagna with meatballs on the side. Goes well with Cappuccino and cannoli, obviously. This review is part of a virtual blog tour hosted by TLC Book Tours. For more information and the complete list of tour stops, click here.